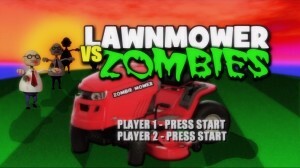 The blurb for the game basically says that even during zombie Armageddon someone has to do mow the lawn. I thought about this and decided that mowing the lawn probably should be quite low down on the list of things to do during a zombie outbreak. I can see it being useful if the grass got over 5 foot tall as that would make any approaching zombies hard to see but otherwise no. 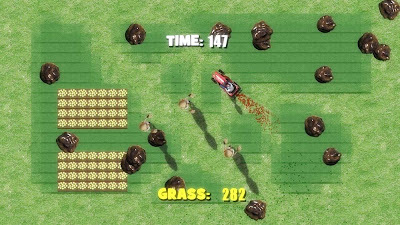 The game has you as a guy sitting on a gas powered lawnmower who must mow as much of the lawn on screen before the time limit runs out. 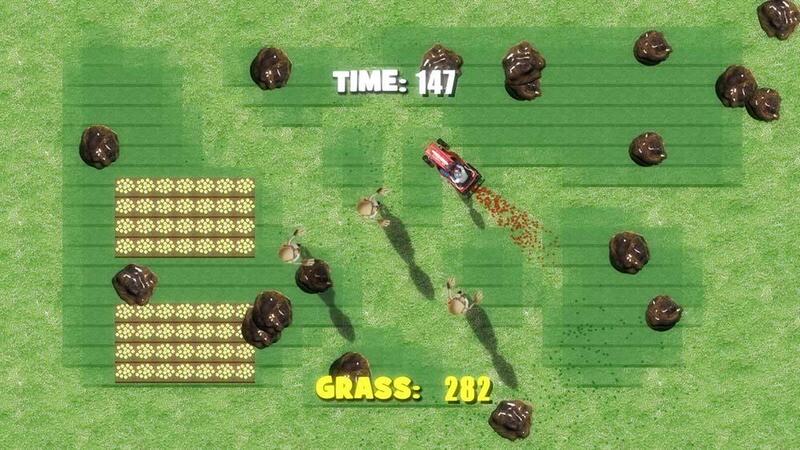 You must avoid randomly walking zombies as well as avoid hitting boulders, or mow over any flowers. 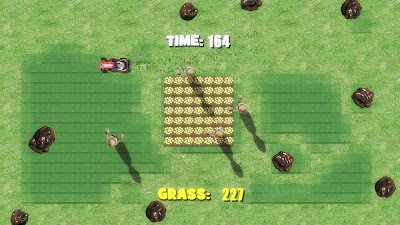 The game takes place from a birds eye perspective but the lawnmower and zombies are all polygons rather than flat 2d sprites. It is done in a cartoony style and really does not take itself seriously. 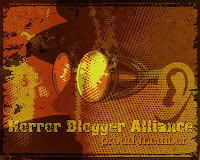 The music in particular is very zany and comedy like comprising mostly of yodellers. Unfortunately the zombies do not look like zombies. Maybe it is just the over head perspective but they look like bald headed scientists rather than the living dead; the only indication they are undead is the moans they make. 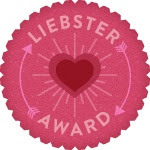 The game is quite fun and while very simple is strangely addictive. The zombies seem to randomly walk around rather than try and get you and often walk off screen never to return. The lawnmower handles like expected, big turning circles needed but I did find problems with the lawnmower hitting rocks in the level. A few times I did this and the lawnmower just bounced off, but once my lawnmower got jammed in the rock and I was forced to just sit there unable to move for a few minutes until a zombie randomly walked into me and killed me; not very fair! The game is fun enough and at 80 Microsoft points is a cheap buy. For once I actually purchased a Indie game rather than review and delete so that must say something for the game. Beware though it is lawnmower VS grass as your goal is not to mash up zombies (like that fabulous scene in Braindead).